Billions of pounds are to be spent on creating a "bigger, stronger" railway, carrying twice as many passengers by 2030, the transport secretary has said. Ruth Kelly said £10bn would be invested by 2014 to increase services and lengthen trains. Among pledges were an extra 1,300 train carriages and upgrades at 150 stations. Consumers raised concerns about fare rises, while Lib Dems said the plan was a "missed opportunity", and Tories said it was "reheated announcements". The government believes its plans will allow trains to carry twice the number of passengers and freight by 2030, but acknowledges that estimate might be outstripped by demand. If that is the case, "more radical options" may have to be considered, particularly on the London-Birmingham-Manchester corridor and on London's busiest commuter routes. It favours extra long trains of up to 16 carriages over double-decker trains, but says a high-speed magnetic rail link and dedicated freight lines were too expensive. Ms Kelly told MPs that the government had drawn up "the most ambitious strategy for growth on the railways in over 50 years". She said the challenge was "to provide a railway that carries more passengers, on more and better trains and on more frequent, reliable, safe and affordable service." She added: "We can't know precisely what our railway will look like in 30 years' time but now we can be confident of making it bigger, stronger and more flexible." But fares will have to cover some of the cost as Ms Kelly said government subsidies had nearly doubled during the "difficult years" of Railtrack. "It is right that we now seek to return it closer to historic levels," she said. She said most people used "regulated fares" which were capped so prices could not rise more than 1% above inflation. 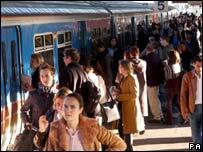 But the transport union TSSA said passengers faced a 34% rise in fares. Also in the White Paper, Ms Kelly said the government was committed to Crossrail, a proposed high-speed rail link from Berkshire to Essex via central London - and was currently trying to "pin down" private sector funding, to match government funding. But Conservative Theresa Villiers said it was another "false dawn" for the £15bn scheme, saying it was "getting more distant by the day". She added that overcrowded trains were packed so tight "it would be a criminal offence to transport animals in the same conditions". And Lib Dem transport spokeswoman Susan Kramer said the White Paper was a "missed opportunity" to get people out of cars and planes and onto the railways and suggested most of the money outlined had been announced before. She said it "seems extraordinary" that the government had not made more mention of Crossrail in the paper. George Muir, director-general of the Association of Train Operating Companies, described the proposals as the "first plausible plan for expanding the railway" in recent years. But passenger groups have been angered that some train companies have raised off-peak prices by up to 20%. Julia Thomas, of campaign group Transport 2000, told BBC Radio Five Live that the White Paper was a "major step in the right direction" but she had two main concerns. "Firstly, those carriages aren't going to be put into place until 2014 so that's a long wait and passenger numbers keep going up," she said. "Secondly, although they are concentrating on bottle necks like Reading and Birmingham New Street where there are major delays, there are quick gains to be made through signal improvements, looking at time tabling that would help passengers now." TSSA general secretary Gerry Doherty said: "Passengers will be forced to pay twice for improvements which are meant to benefit them, first as taxpayers and then as rail users. "Ministers claim they want to encourage rail travel and then kick passengers in the teeth with huge regular hikes in fares. They are pricing people off rail and onto the roads." A new station will be built at Blackfriars spanning the Thames, with a new entrance serving the Tate Modern art gallery on the South Bank. Some £425m has been earmarked for five new platforms to improve capacity at the station, which has become a bottleneck for passenger and freight trains serving the south and west of England and Wales, and Oxford and Gatwick Airport. £128m will be spent on redeveloping New Street station to improve passenger facilities, including opening up the cramped, underground platforms to natural light. Can government plans improve rail travel? How much must we pay to sit down?